Selecting the best natural wax to use in your home made candle making business depends on several key factors. 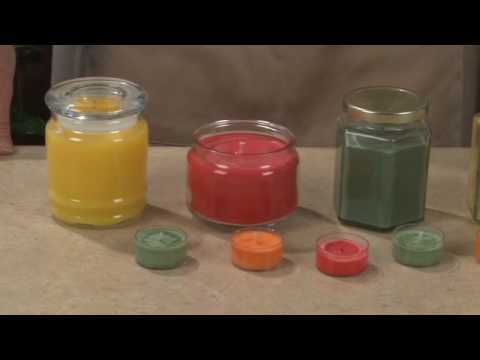 For one, you need to determine what type of candles you are going to make since the type of natural wax you would use for container candles is very different from the type of natural wax you would use for taper candles. Next, you need to determine what the most important wax qualities are to you. Is it important that the wax is easy to work with, requires very little to no additives, or offers a stellar scent throw? Ultimately, the decision comes down to personal preference. The first and most common form of natural wax is soy wax. As the name implies, soy wax is made from soybeans, and is an all-natural vegetable wax. Soy wax, because of its composition, burns cleaner and cooler than paraffin wax. It contains fewer toxins and carcinogens, but also tends to be a little bit more expensive. Because soy wax is made from an agricultural product, many folks like the fact that it supports the agricultural economy versus the petroleum industry, of which paraffin is a by-product. Soy wax is most often used in container candles and votives, and very often requires the addition of additives to eliminate some esthetic concerns and to increase fragrance retention and scent throw. Although soy wax offers many environmental and health benefits, it can be tricky to work with. Another natural wax to consider is beeswax. While beeswax is the longest burning of any candle wax available, it is also one of the most expensive. Beeswax is most commonly used to make taper candles, and while it can be used in other types of candle making, most folks find it simply too expensive to use in most applications. A common way that beeswax is often used is to blend it with other waxes. Because of the burn life of beeswax, many candle makers choose to experiment and develop a unique wax blend that includes beeswax, giving them the results, they wish to achieve without significantly driving up costs. Two other types of natural wax for home candle making are palm wax and bayberry wax. Because of how they are derived, both of these waxes are considered vegetable waxes. Bayberry wax is derived from the berries of bayberry bushes and is a very hard wax that has a natural bayberry scent. Palm wax is derived from palm trees. Both of these waxes are slightly more expensive than paraffin wax, and are most often used as additives or in blends with other types. When considering using natural wax in your candles it is important to consider your personal preferences as well as your target market. If you feel strongly about supporting the agricultural industry and about offering a vegetable based product, then soy or other natural waxes may be a great option for you. If you plan to sell your candles at farmer’s markets or to natural food stores, than you probably want to choose a natural wax as opposed to a paraffin wax. While natural waxes do tend to cost slightly more upfront, if you market your candles to the right clientele and plan to take the time to educate folks about their benefits, then most consumers are also willing to pay a little more for your product. The choice all boils down to your sales goals, your buyers and your personal preferences.